'Blitzen' (Marky Smith, R. 1998). Seedling #95-34A. 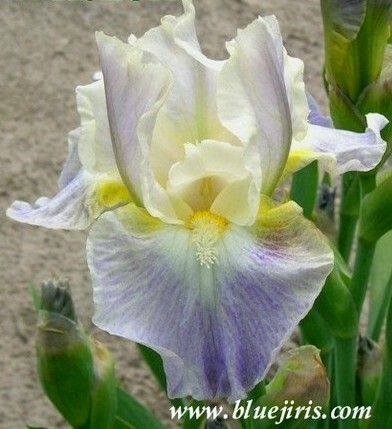 IB, height 24" (61 cm), Early midseason bloom. Standards greyed tuscan yellow (RHS 162C) blending to lavender midrib wash; style arms clear primrose yellow; falls primrose yellow ground washed soft violet (near 90D), sides redder, butter yellow shoulders, primrose wire rim and veins at sides, cream white surrounding and long point below beard; beards cream at end, yellow midsection, orange in throat; ruffled; slight musky fragrance. 'Low Spirits' X 'Gemstar'. Aitken 2000.